Thirty per cent of timber bridges in regional NSW are in a poor condition, making the restoration of these critical transport arteries a priority for local governments and councils. Given the importance of these transport routes and the safety of the local community, councils have needed to lower payload and speed limits as a precaution to the continued deterioration and disrepair of the state’s 2,000 timber bridges. 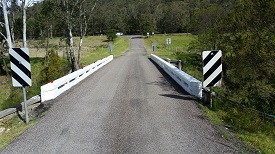 When a bridge is closed for maintenance or repairs, or is load limited, the impact on the local community can be significant, particularly if the bridge is one of only a handful of access points crkconnecting a region, as is the case with the farming area around Cedar Creek Bridge in NSW’s Hunter region. 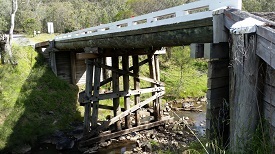 As one of 74 bridge assets in the Cessnock local government area, the ageing timber bridge was highlighted as a priority for urgent restoration given the significant deterioration of the corbels, girders and deck planks. 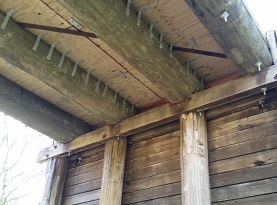 “Heavier vehicles cause much more vibration in the bridge as they pass over, this can cause bolts and fasteners to rattle loose over time requiring higher maintenance and causing increase wear to the joints in the timber,” explains Justin Fairfull, Cessnock Council Bridge Inspector. The council had implemented a six-tonne load limit on the bridge as a short-term solution while it searched for a low-cost alternative to a steel or concrete replacement, both of which come at significant costs to the community. Bridges form a vital part of Australia’s transport network, with around 30,000 timber road bridges in service throughout the country. In NSW, timber bridges are recognised for their place in the state’s colonial history, with many of the old bridges classified as ‘State Significant’ under the Heritage Act. However, heavier and faster moving vehicles have put a considerable strain on these old timber bridges, accelerating the rate at which many of these ageing timber structures have been deteriorating. underAs Fairfull explains, due to the condition of the bridge and the local community, comprising of small farms, a bed and breakfast, and a wombat refuge, who needed access to this infrastructure, a fast installation to minimise the impact on the residents was critical. The bridge restoration took just three days – four days ahead of schedule – with the council contracting two work crews around-the-clock to restore it quickly. In full consultation with the residents, the council managed issues of transport and water, with a shuttle bus made available to transport residents to and from their properties, and a pedestrian walk bridge was maintained throughout the project to enable continued access for those getting around on foot. Fairfull estimates that to take the old bridge down and replace it with a new steel and concrete bridge would take a minimum of two months, likely even longer. rdA retrofit solution that can help extend the life of timber bridges by decades, Bridgeply offers a low-cost option for rehabilitating existing, older timber structures without needing to replace the entire bridge – meaning only components that are failing need to be replaced, saving time and material costs. Faster to install due to its light weight, Bridgeply can be moved in larger sections with the same machinery used for alternative materials, so less trucks are required for delivery and less crane movement to install components is needed. Additionally, as a timber-based product most of the machinery alterations such as drilling, can be done on site with hand tools. This, together with the lightweight material, means installation can occur in a timely manner, with minimal disruption to the local community. “We are very happy with the result. We are currently restoring five other bridges in the area and we are using the same product because it means minimal downtime for the community and it lasts a lot longer, so there is much less maintenance,” says Fairfull. 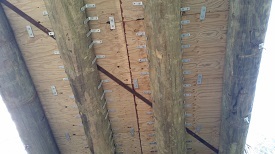 More information about Big River Group’s plywood and bridge decking products can be found at www.bigrivergroup.com.au.